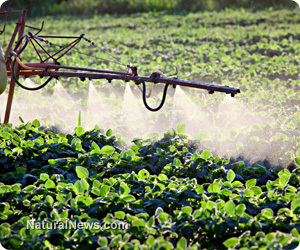 (NaturalNews) New monster varieties of weeds are taking over fields across the globe, as the use of ever greater amounts of pesticides to cultivate herbicide-resistant genetically modified crops has unleashed a monster. Experts in weed management are sounding the alarm and looking for new ways to handle the problem after fifteen years of agriculture based largely around Monsanto's flagship Roundup herbicide, during which "extensive and sustained use of glyphosate as a sole weed control mechanism" has now forced many farmers to pull weeds by hand or return to a costly mechanical tilling of the soil. The rise of herbicide-resistant superweeds has become such a widespread issue that coping mechanisms and mitigation strategies were a dominant topic at the American Chemical Society, the world's largest science and industry society, when it held its 246th National Meeting & Exposition. Costs associated with weed control have doubled, and in some cases tripled, during the same period that crop yields have fallen sharply, casting doubt on claims that GM crops are poised to solve global food security issues. "The problems associated with herbicide-resistant weeds are spreading and intensifying, especially weed species resistant to multiple products, including the mainstay of 21st century agriculture, the herbicide glyphosate," said Bryan Young, Ph.D., a professor of Plant Soil and Agricultural Systems at Southern Illinois University in Carbondale who specializes in weed management strategies. "More than 200 individual weed species have been confirmed resistant to at least a single herbicide, with infestations covering millions of acres in the United States and 60 other countries. It is spreading beyond soybeans and cotton [emphasis added]." "Weed management in corn has become more and more difficult in recent years due to herbicide-resistant weeds," Young stated during his address to the American Chemical Society. The problem parallels the rise of dangerous new drug-resistant "supergerms" as a result of overusing antibiotics - the treatment has essentially backfired and created a problem that is difficult to control. Reproducing rapidly, crowding out crops and competing for moisture and nutrients, superweeds are defying multiple rounds of glyphosate - and now, increasingly, other herbicides like atrazine - and thriving. Typical of these new classes of superweeds is Palmer amaranth pigweed, which can grow as tall as 10 feet at an inch per day and has a stem thick enough to damage farm equipment. The weeds inherit resistance to these herbicides. To fight back, the agribusiness industry is developing new herbicides that they claim work to "sidestep" the resistance mechanisms of weeds, while maintaining emphasis on herbicide-resistant genetically-modified crops like Bt varieties. For Young and other experts, this will require a complex approach that takes into account seed selection, crop rotation, soil conditions and a combination of more pesticides - new varieties of herbicides expected to gain approval and come to market - including 2,4-D, dicamba, isoxaflutole and mesotrione. In particular, Dow Chemical's 2,4-D, a major component in Agent Orange, which was controversially used during the Vietnam War, is scheduled to emerge as a major alternative to glyphosate and will also be deployed widely in combination with glyphosate. Farmers using these new chemicals will have the additional burden of coordinating them with evolving GM seed varieties that match resistance with new pesticide strategies. Bill Freese of the Center for Food Safety commented on the problem back in 2010, noting, "The biotech industry is taking us into a more pesticide-dependent agriculture when they've always promised, and we need to be going in, the opposite direction." While herbicide-resistant superweeds have required modern agriculture to use more chemicals than ever before in a trend that will continue to spike, some are even attempting to perfect autonomous weed-killing robots that would individually target unwieldy superweeds that more and more pesticides just can't control.